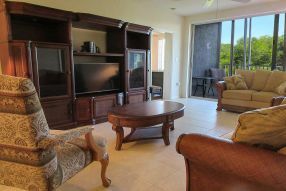 Captains Bay | Fort Myers Vacation Rentals | Kathy Nesbit Vacations, Inc.
Captain’s Bay is a short walk across the street to a great Tiki Bar and the Gulf’s beautiful white sand beach. From there, you can walk either south towards Lover’s Key State Park and enjoy the nature walks or shelling on the beach, or north to the Times Square area to enjoy all the shops, restaurants and activities that the island has to offer. Santini Plaza is a few blocks south and offers shopping, a marina and restaurants. Located on the south end of Estero Island, Captains Bay Resort Condominiums offer a small community feel with large community amenities. A large pool invites you to swim or just soak up the sun; for those more adventurous souls there are tennis courts on the grounds for a good workout! The BBQ awaits you in case you want to eat in during your vacation. Building elevators, secured entrances, ample parking provided.